Description: Sexes similar. Very pale above, white below. 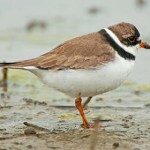 In breeding plumage has single complete black breast band. 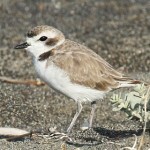 Sometimes the breast band can be incomplete, especially in females and juveniles. White forehead and small black cap. Legs are orange. Bill is yellow with black tip. Habitat: Sparsely vegetated shorelines of shallow water bodies. Prefer shorelines with areas of bare sand, and sandy or pebbly mud. Where in Nebraska: Occasional to rare spring and fall migrant, and rare local summer resident. Recent breeding records for Platte, Niobrara, Loup, and Middle Loup Rivers and at Lake McConaughy. 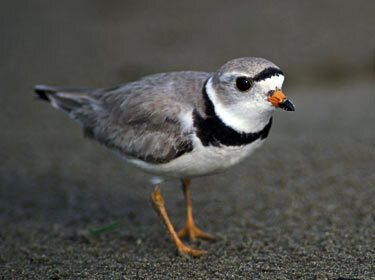 About 350 pairs of Piping Plovers breed in the state. 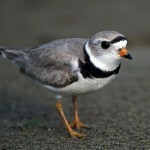 Piping Plovers use a “foot-trembling” technique to agitate sand and draw invertebrates to the surface.